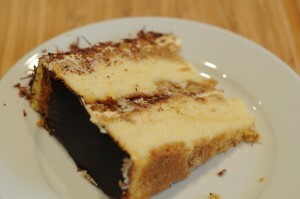 The tiramisu cake was a huge success! 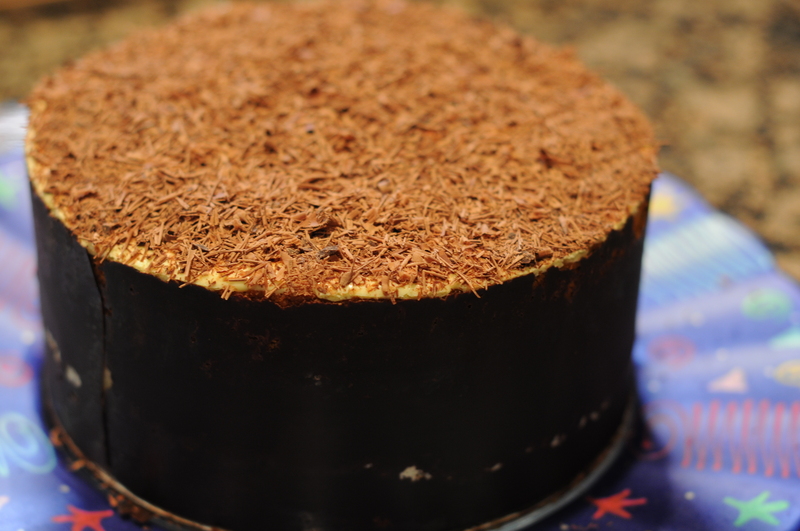 My son requested this for his birthday, specifying the cake be ‘very buttery’…he wanted cake in place of the lady fingers traditionally used in tiramisu. I made the All-Occasion Downy Yellow Butter Cake from The Cake Bible* as the base, and my soaking liquid was espresso mixed with sugar and scotch (another change requested to replace the Marsala). For the filling I used a recipe I have made many times for a traditional tiramisu. It had eggs, mascarpone cheese, sugar and scotch (again, a change from the Marsala); however, it was not firm enough, and I was afraid the cake would slide apart if used ‘as is’. I decided I needed to wrap the cake with a sheet of chocolate to make sure it stayed together. So in a desperate late-night attempt to finish the cake before my son returned from college, I quickly melted some dark chocolate and spread it on my liner. 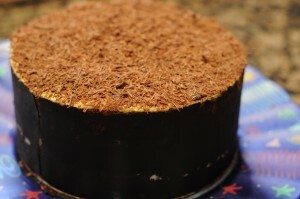 I wrapped the inside of the cake pan (chocolate side facing in so I could peel the liner away later), then proceeded to layer in the cake components: 1st soaked cake layer, then some of the mascarpone filling, followed by a sprinkling of dark chocolate shavings; 2nd cake layer, more filling, more chocolate shavings. At that point it went into the fridge where it sat overnight to set up and let the flavors come together. The next morning I removed the cake from the pan and unwrapped the form, revealing an ever-so-thin sheet of chocolate surrounding the cake and holding it all together. The final result was delicious…I was worried that I should have used a more firm cake base to stand up to the soaking, but the taste and texture really worked. My son said it was his favorite of all the cakes I had made. < Previous Returning to the Nest (and all that Jazz)! Next > Aaaaaannnnddd……we’re off! The journey begins!! !